You have a server, and would like to see it active. There are many things you can do to attract or repel potential players to/from your server. I found most of this self-explanatory, and one thing I like about Armagetron is the truly wide variety of things you can do to make a server unique. This text doesn't address server physics, which is an even more subjective matter- just aesthetics. The server name will be a major defining factor in making a first impression, and thus drawing people in who haven't played in your server before. Of course it shouldn't be too long, nor should one have tons of servers with the same name. This is regarded as spam, and can lead to a ban. Servers that are meant to be part of a 'group' or operated by one clan can be grouped visually, just by using a similar prefix or a color code which is repeated. One doesn't have to use any color codes at all. However, the server names that stand out the most are those that utilize color codes effectively and attractively. The server name consists of 8 different color codes, changing from letter to letter, but with consistent order from word to word. It's not a smooth color gradient, but a contrast symbolizing the 'craziness' of the server and its 'weird maps' that are mentioned in the server options. CTWF is a very successful server, and subjectively, the coloring of the name may be a significant factor in this. However, it should be noted that many of the more attractive server names use color in less extreme ways. 3. Changing the server name to reflect this and hope people take heed (Note: not always effective). Maybe not a proper welcome message. Fails to tell you anything about the server's gameplay, rules, or administration. 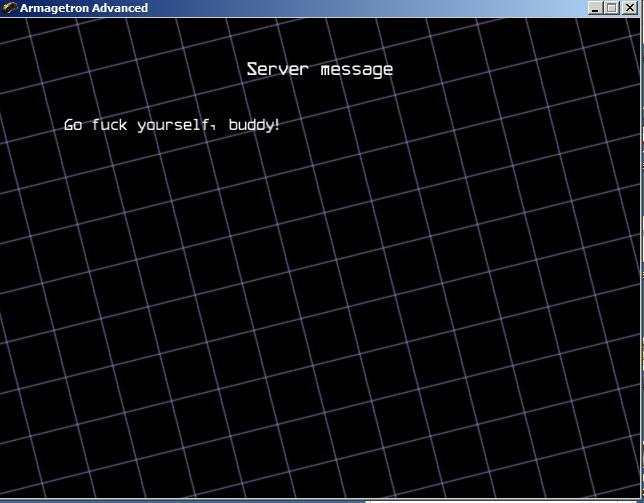 The welcome message can be very useful in informing players about the server they are entering, or just look spiffy. You can utilize ASCII art (as used in Wild West Capture The Flag) or give a detailed description of your game (like in many Fortress servers or Dodgeball). One may also advertise their clan site, or a way to contact the administration of the server. A ping limit is a bad idea. Who knows what players you will never meet because you obstruct your server's door? Imagine Xyron would be banned from all sumo servers. You may also miss out entirely on the Australian portion (it's more than you'd think) of Armagetron players. I don't like servers with a long list of rules that are not predefined by the settings. While settings are always valid, regardless if they are popular or not, rules have to be enforced by server admins and moderators. 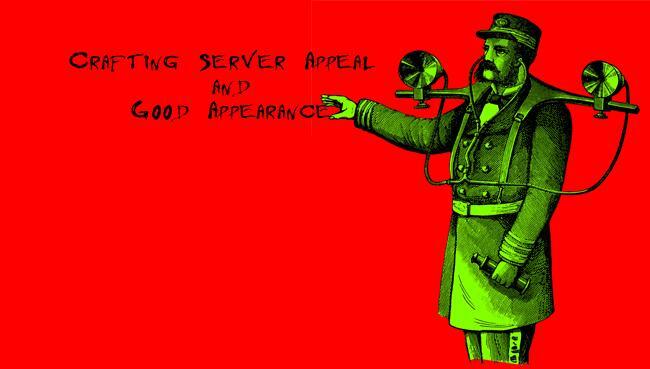 If server staff interfere too frequently, players may stay away completely (see: Playing Open). However, all of this is my personal opinion and it's your choice what you do with your server. Rules should be clearly dictated in the welcome message, and preferably also in the server options (alternatively, if rules are short and simple, in round_console_message). Nobody likes to be kicked for "closing" or "stabbing", particularly when rules weren't clearly defined to begin with. Our internet society isn't so rotten that you have to add good behaviour to the rules. But it can have a positive effect on the server's climate if admins are there to handle your players' issues and to ensure they don't degrade others, teamkill, or otherwise ruin their armagetron experience with their n00bery. Having a list of people to contact in cases of severe n00bery can be helpful. Center messages should be used rather sparingly, perhaps for a short URL or clan name. Abuse of center_message and round_center_message can be rather annoying to players. Both the welcome message and the console message provide enough room for rules, guidelines or additional help. This page was last edited on 15 November 2010, at 01:50.